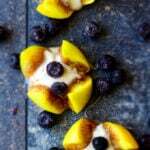 Looking for a healthier sweet summer snack? 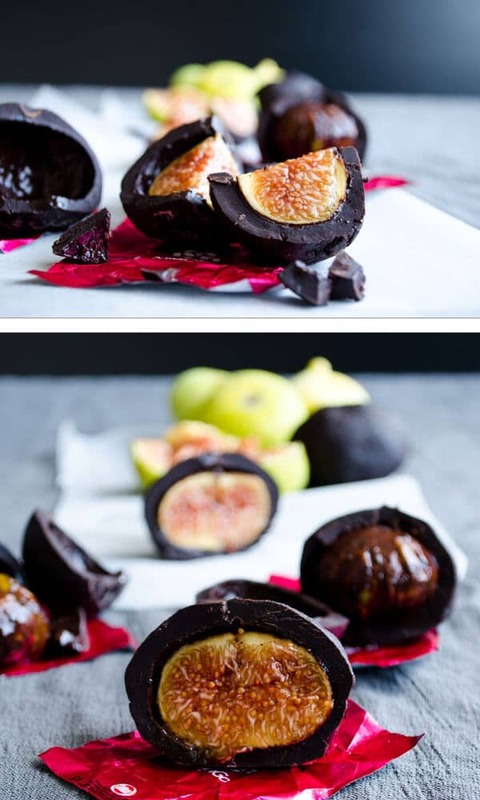 Make these Chocolate Covered Figs! 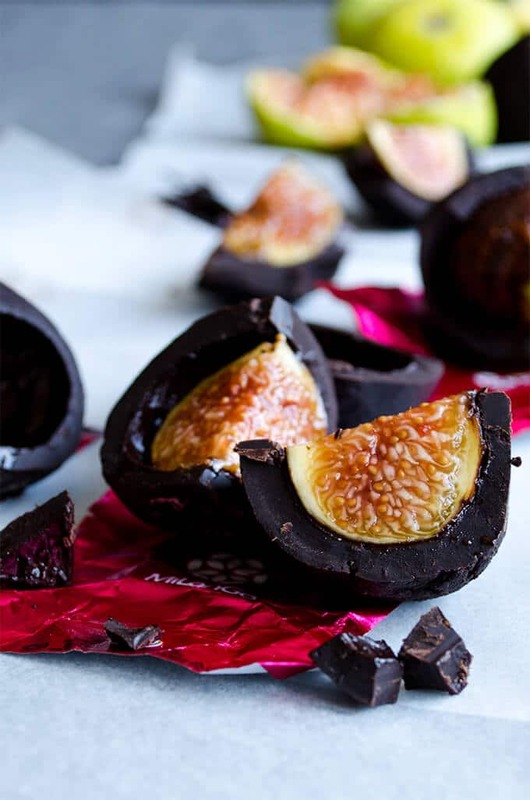 Jammy fresh figs are coated with a dark chocolate mixture and then chilled. The sweetness of figs and bittersweet flavor of dark chocolate are perfectly balanced. So impressive! Are you a fan of fresh figs? Do you love them as much as I do? What about chocolate? 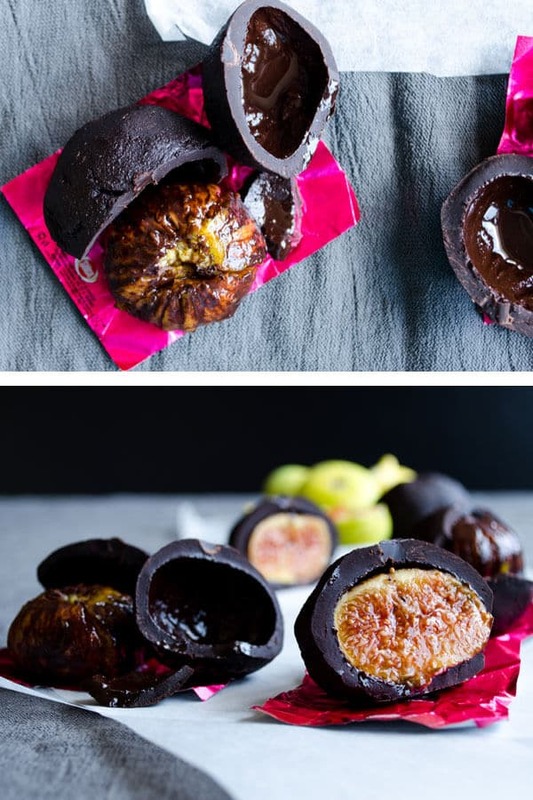 If you love them both, you will love these Chocolate Covered Figs! I realized how chocolate and figs make a perfect match after making these Chocolate Fudge Brownies with Figs and decided to make something easier yet as tasty. Well, to tell you the truth this chocolate covered figs recipe accidentally came out one night when we were making chocolate fig tart. I was melting dark chocolate in a heatproof bowl over boiling water. I had to leave it for some minutes and told Yusuf to add in heavy cream inside and mix. Guess what? When the melted chocolate became thicker, he realized that he added cold milk instead of cream. When I came back to the kitchen, he looked perplexed and a little angry. It got thicker and thicker as he mixed and it couldn’t be the chocolate glaze on a tart! We both hate wasting food and we didn’t want to just throw it away. We definitely wanted to make something with chocolate and fresh figs. Then we came up with this idea: “Why not cover the figs with chocolate?” These were so good that we’ve made this ridiculously easy recipe several times since then. When we were discussing what could be made with that stiff chocolate mixture, I remembered I had seen Dried Figs Covered with Chocolate recipe. Yet, I wasn’t sure how it would be to use fresh figs. To my surprise, they were so good! It’s not like dipping figs into melted chocolate. It becomes like a soft dough when milk is added, so you have to shape it in your hands. Take a piece of chocolate dough, a bit bigger than figs and flatten it in your hands. Then place a peeled fresh fig in the center and close it up by forming gently until the fig is completely covered. Repeat for the remaining figs and chocolate. Nobody can guess there is a hidden fig inside! We waited them in refrigerator the whole night and they were perfectly stiff in the morning. It is so fun to eat these. You first hear the cracking noise of stiff chocolate and then reach the lovely softness of figs. They are perfectly chilled inside, so it’s a great refreshing suprise in the center. I slice these chocolate covered figs with a knife when eating since I think it could be messy when it’s bitten. If your figs are small enough, you can just throw them in your mouth as they are. I’m sure it would be even better! Perfect sweet snack made with chocolate and fresh figs. Melt chocolate in a heatproof bowl over boiling water. Add in cold milk and mix with a spatula. It gets thicker this way. Let the mixture reach room temperature. Peel figs. This is optional. You can use them with their skin on. Take a piece of chocolate dough, a bit bigger than a fig and flatten it in your hand. Place a fig in the center, gently form it with your hands and close it up until the fig is completely covered. Place them on a baking paper so that they don’t stick. Chill in the refrigerator at least for 4 hours and serve cold. This post was originally published in 2013 and has been updated with additional information. Oh how I wish I had access to those beautiful figs… And chocolate?! Seriously yum! Thank you my friend! We were really amazed when we had the first bite. You have to give it a try when you have can find fresh figs there. What kind of dark chocolate do you use? Is it sweetened? Is it a baking bar? Hi Kelly! Use either chocolate chips or chocolate bars to melt. Peeling figs is optional. I peel them just to have a smoother texture. Oh man! Those look so yummy! They just look like kinder surprise eggs fallen from heaven! 🙂 yummy! Hi Zerrin, If you add a small amount of liquid to melted chocolate, it stiffens.